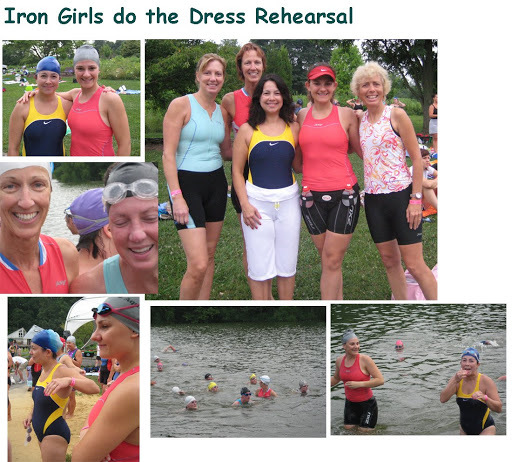 The Iron Girls made their official debut at the “Dress Rehearsal” event for a workout of swim and run at 6AM in Centennial Park. Over 1000 ladies participating in this year’s Columbia Iron Girl event on Aug 23 – were here for the trial event. Our individual event sista-hood included Jill and Holly, and the relay event sista’s Divina (Little Mermaid), Jane on bike, and Emma with wings on her feet were ready for the challenge. For today’s event, it would be a test for the swimmers to get the flavor of open water swim, and a quick transition to the run. No biking today (unless you wanted to brave Route 108 in rush hour traffic). Jill and Holly were in the early swim wave, and got their run finished in plenty of time to take a shower and begin the feasting activities EARLY at Eggspection Restaurant. Emma and I got a late start on the run – which meant the humidity was high, and there was excessive sweating along the challenging 3.4 mile course. Thus, whoever sat next to Emma and I at breakfast, got a real treat of bad air! The rehearsal event was a complete success, and we are all inspired to train harder and smarter (except for Emma who already runs at warp speed) for the next 3 weeks – til event day!